It all started in April 2004 with my first long-distance hike from Mexico to Canada: The Pacific Crest Trail (PCT). After finishing it in 5 months and 1 day I realised I had become addicted to long-distance hiking. 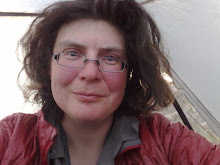 I still had to work a bit, but in June 2007 I was on the trail again on a southbound thruhike of the Continental Divide Trail. After finishing the CDT in November 2007 I returned to Germany to start a full time hiking career (and this blog) in all seriousness. I gave up my apartment, put all my worldly belongings in a storage unit and started my first round the world trip in spring 2008 with a bike trip on the Eurovelo 6 through Europe. 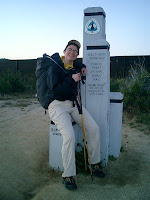 In June 2008 I flew to the US to hike the Appalachian Trail (AT) southbound. Completing the AT in November 2008 earned my the Triple Crown, which at that point had only been awarded to about 100 other hikers. I continued on to Australia for some more hiking on the Bibbulmun Track in December 2008 before I gave cycling a second try. I soon met a British round the world cyclist and we ended up cycling together for seven months through Australia, New Zealand, Japan and South Korea from January until September 2009. I returned to Germany for 3 months, but started my second round the world trip in January 2010 with a thruhike of the Florida Trail, followed by a thruhike of the Arizona Trail in spring 2010. I spent the rest of my 6 months visa cycling through Southwestern USA. In July 2010 I flew on to Australia to cycle the Stuart Highway and to hike various long-distance trails like the Larpinta Trail, Great South West Walk, the Heysen Trail, the Hume and Hovell Track and the Bibbulmun Track for the second time. I returned back to Europa via Asia where I spent the first quarter of 2011 backpacking in Singapore, Malaysia and Brunei. After having been abroad for so long I enjoyed a hike across Germany in spring 2011. In the previous years I had already done some short paddling trips in the Boundary Waters Canoe Area in Minnesota and in the Everglades in Florida, but in summer 2011 I started paddling in all seriousness with a thrupaddle of the Yukon. Because I was forced to quit the paddling trip earlier than planned I had time to do some hiking in Denali National Park in Alaska. I returned back to Germany and hiked the length of Great Britain from John O'Groats to Land's End in autumn 2011. Luckily I could recover fromt this exhausting hike on my former cycling partner's narrow boat on the British canals. I spent the first quarter of 2012 preparing for my next trip and from April to September 2012 I hiked 4,500 km across Western Europe on a route planned myself. This has been the first part of my project to hike all across Europe from East to West. The last quarter of 2012 I paddled the Mississippi River from its source to the Gulf of Mexico followed by a 5 weeks winter hike in the Southern Appalachians. Summer 2013 was spent with a bike trip across Scandinvia before I tackled my next big hiking project: I want to hike from the Southernmost point in Europe (Tarifa in Spain) to its Northernmost point (North Cape in Norway). I did the first part of this project, a 3,800 km hike through Southern Europe from the river Rhine in Germany to Tarifa in fall and winter 2013/14 proving that you can comfortably hike in Europe year round. 2014 is a year of cycling and paddling. I spent the entire summer cycling from Berlin to the Baltic States and Finland and fall paddling through Southern Sweden. I did not hike much in the next two years because I wrote two books: Laufen. Essen. Schlafen. which became a bestseller in Germany in 2016 and Wandern. Radeln. Paddeln. which is about to be published in 2018. Still I squeezed in some shorter hikes in Europe and Israel and thruhiked Hungary. In summer 2017 I eventually hiked the Eastern European traverse and thus completed my European thruhike from Santiago de Compostela in Spain to the Black Sea Coast in Bulgaria.